It's New Year's Day, 1999 and I'm sitting in my trailer in Death Valley National Park. I just took this set of pictures of a steam tractor that was used for a short while to haul borax over terrible roads in equally terrible desert heat. This is just a relic now, but in its day, it must have made an awesome sight chugging across the desert. I found this old photo of Old Dinah at the Borax Museum at the Furnace Creek Ranch in Death Valley. It actually did run but it would appear that it was not overly successful. This placard accompanied the photo above and provides a short summary of history of Old Dinah. 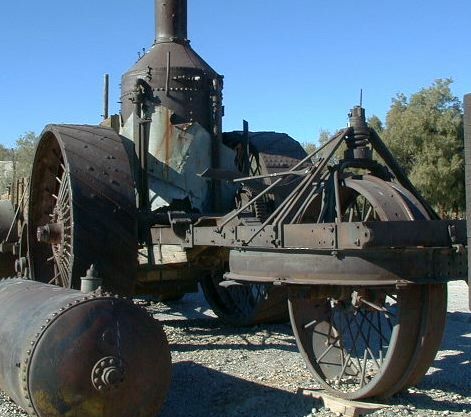 This mechanical marvel was purchased in 1894 and it was intended to replace the 20-Mule Teams that hauled borax from the Borate to Daggett. Old Dinah required constant maintenance and had major problems with sand and steep grades. After a one year trial, mules proved more productive and reliable, but they too, were replace later by a narrow gauge railroad in 1898. Old Dinah got one more chance when borax operations resumed in Death Valley in 1904. 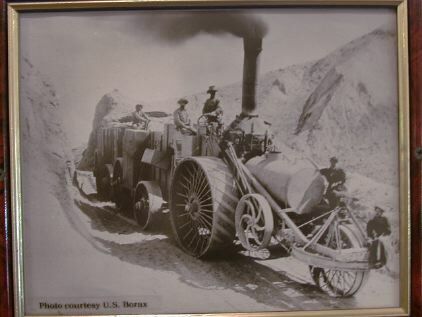 Trying to avoid the expense of a railroad into Death Valley, the Borax Company graded a 98 mile tractor road from the borax mines to the railroad. Dinah broke down on her first trip, and hand to be towed home by the very mules she had tried so long to replace. 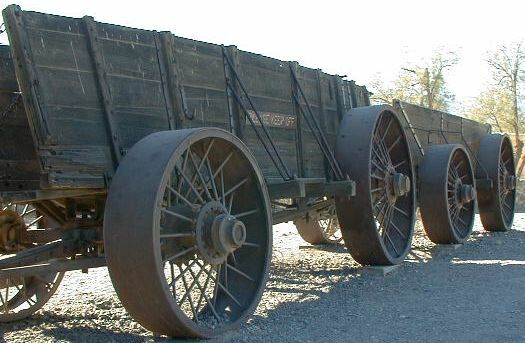 In 1910, Old Dinah was sold to a freighter for use hauling supplies between Beatty and the Keane Wonder Mine. After a couple of years, Dinah broke down in the Daylight Pass and her owner abandoned her in disgust. In 1932, Harry Gower rescued Old Dinah and brought her to her present location at the Furnace Creek Ranch. Most of what I know about the history of this tractor is on the sign provided by the Park Service, a couple of comments about it that I found in the Visitor Center bookstore and the displays at the Furnace Creek Ranch Borax Museum. This tractor was such an attractive display, that I took an inordinate number of pictures. 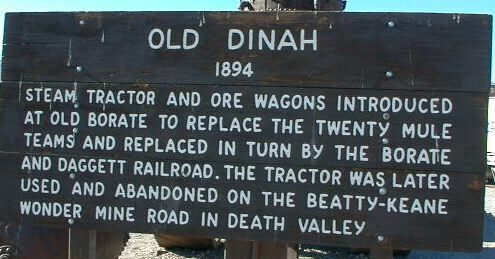 Old Dinah is currently on display in front of the Furnace Creek Ranch in Death Valley National Park. Dinah was built to replace the famous 20 Mule Teams (actually 18 mules and 2 horses) that had been used to haul borax out of the salt flats of Death Valley. It took the team 10 days one way to haul 24 tons of borax (a valuable mineral used in glass, soaps, fluxes and glues) from Death Valley to the railhead 165 miles distant. Just as an aside, this is the true meaning of the term "team track." A team was literally drawn up beside a train for loading or unloading. Here a load of 24 tons of nearly pure borax is being loaded onto the AT&SF. 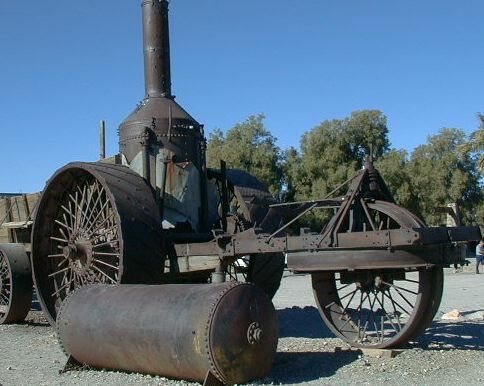 Old Dinah was a tricycle type steam tractor with a upright boiler and gear drive. From the wear patterns on the ridged front and cleated rear wheels, the wheels were run as they are, steel rims against hard dirt. Old Dinah was not a real speedster at 3,5 mph at best, but faster than mules. Old Dinah had no sign of having any brakes at all. 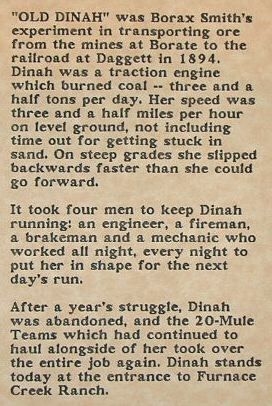 From information I found in a book on borax mining, Old Dinah burned oil, however I didn't find any sign of an oil tank. Also, the placard in the museum indicated that it burned coal. The tank on the ground was probably its water supply. 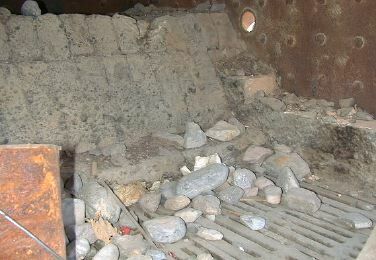 There is a saddle above the frame that clearly held the tank and there was a photo in a book showing the tank in that location. Old Dinah must have been hard to feed, as whatever water was available in this desert has large quantities of dissolved salts, the worst up to 6%. Old Dinah was claimed to be unsuccessful even though it could haul much more borax in a load than the mules. Compare the size of these wagons to the ones on the 20 mule team above. I estimate that the load was probably 3 times that of the mule drawn wagons (hence the steel wheels) and it probably made the trip in about half the time. However, the reference books indicated that it had a tendency to sink into soft dirt (requiring the mule teams to pull it out) and it tended to rear up on steep grades. 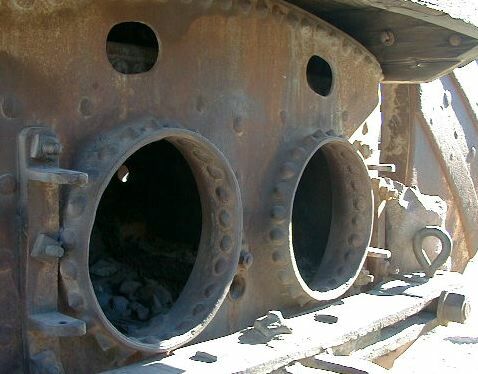 Old Dinah was powered by two cylinders situated between the frame members just forward of the boiler. 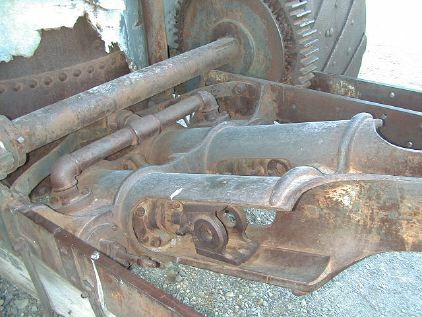 Part of the mechanism is gone, but the crossheads were apparently connected to a crank shaft that was held in the remaining bearings. The cylinders were fed with piston valves, a little unusual for an machine built before the turn of the century. 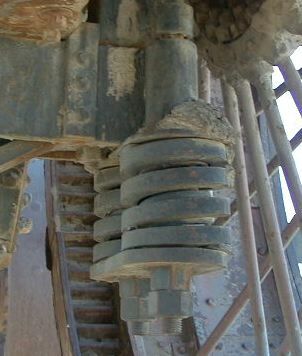 The missing shaft was connected to this large gear probably by a short gear train that fit within the double frame rails on that side. Inside this main gear are smaller differential gears that transferred torque to the wheel drive gears. 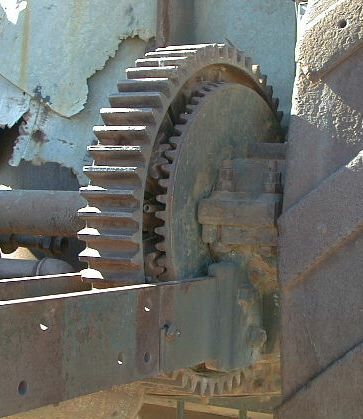 The wheel drive gears engaged a circular rack inside the drive wheel. 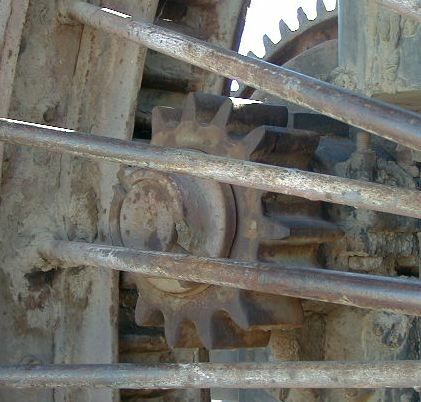 When Old Dinah was moving forward, the dirt and rocks that fell into the rack would drop out before they got to the drive gear. I imagine that this gear was run mostly dry so that it would not collect crud. 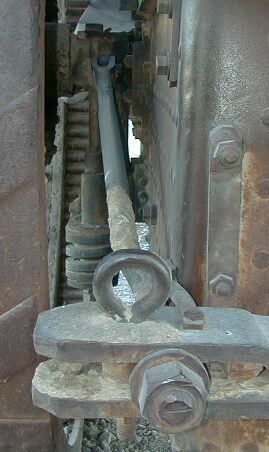 Old Dinah transferred its tractive effort from the main wheel shaft to the drawhead at the back of the tractor through bars bolted to the axle assembly and the drawhead. Old Dinah had a sprung suspension of shorts. Two coil springs under the tractor on each side supported the weight of the tractor and a third spring was on top of the front wheel assembly. Even so, it appears that its suspension travel was severely limited, probably not more than 2" total. It must have been a pretty harsh ride. Old Dinah's firebox was small. I didn't see any signs of an oil burner in the firebox. Since the cylinders were quite small and the tractor's speed was probably quite low, the small firebox probably still allowed the boiler to make enough steam. The grate was pretty small, but it looks like a coal grate. It wouldn't need grate shakers as all of the grate could be easily reached to be cleaned of clinkers.